SHIFTING GROUND is a collection of 12 short stories set in dystopian New York State, a place where some children are born illegally and outcast, where being gay is illegal, where the lower class isn’t allowed to read, have children, or get married, and where upper-class women don’t get to choose the person they are to marry. 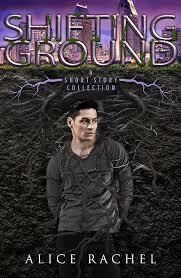 SHIFTING GROUND is a collection of 12 short stories set in dystopian New York State. Join Chi, a child born illegally, running for his life, Akio, a gay boy ostracized by society, Craig, a lower-class boy crushed by his condition, Morgan, a girl forced into marriage to a boy she will never love, Jackson, a gender-fluid boy living in a state where being queer is against the law. Additional Notes: The author pledges to donate 100% of sales revenue from “Shifting Ground” to The Ally Coalition (an LGBT association helping LGBT+ youth in need). We're currently working on making the site compatible with Library Extension. For the time being, it may not show all book availability. Thanks for your patience while we work on this!